BP-4001 : Alkaline Battery Case for Motorola GP68 radio. 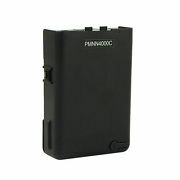 Home > Commercial-Land Mobile-Marine > BP-4001 : Alkaline Battery Case for Motorola GP68, radio. BP-4001 : Alkaline Battery Case for Motorola GP68, radio. BP-4001 : Alkaline AA Battery Case for Motorola GP68 radios. Holds 5 x AA Alkaline batteries (sold separately). Provides instant high-watt operation or GP68 series radios ! HNN4001A : 7.5 volt 2100mAh long life rechargeable Ni-MH battery for Motorola GP68 radios, etc. HNN4001A : 7.5 volt 2100mAh long life Ni-MH battery pack (extends radio 1.5") - fits Motorola GP68 radios (worldwide). Replaces NTN4001A, NTN4001B, NTN4001C,etc. 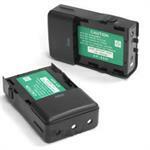 BC-4001 : Desktop Rapid Charger for batteries for Motorola GP68. For use with HNN4001, HNN4001A, PMNN4000, etc. Charges NiCd and NiMH batteries.